The K-45 features the latest in drain gun design. The slide-action hand grip lets you operate the gun while the drum rotates. To manually push the rod past tough obstructions, just pull the hand grip back to lock the cable feed. Push the hand grip forward to release the lock, which allows more cable to be drawn out. Use the K-45 to clean 3/4 to 2-1/2" lines. Speed is 0 to 600 rpm with variable speed/reversible operation and a constant speed control button. Motor is 120 VAC, 50/60 Hz, single phase, 3.2A. Drum capacity is 50 ft of 5/16" cable or 35 ft of 3/8" cable. If you want to use more than one cable but don’t want to reload the drum when switching cables, order an additional inner drum separately. 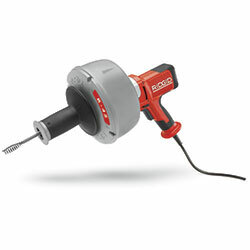 Includes: 5/16" x 25-ft cable with bulb auger.